in gathering the dirty clothes. Oh my gosh-I can not even start to explain how many times I have TRIED to teach them about sorting! Now there is a new Purex detergent that solves these problems. Purex No Sort for Colors detergent is the latest innovation from the Purex brand designed to simplify your laundry routine. 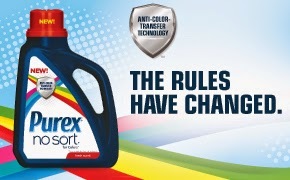 Purex No Sort for Colors detergent features a Anti-Color-Transfer technology, which traps loose dyes in the wash and reduces color bleeding accidents in your mixed color loads leaving your clothes bright and clean. your clothes bright and clean. I also have 2 free coupons for Purex No Sort for Colors detergent to giveaway to one of my readers. Good luck! How do you enter? Please leave a blog comment and like my FACEBOOK and follow me on TWITTER. The winner will be picked randomly on April 21st by 12 p.m.
Look for this Purex detergent at your favorite store like Walmart or Target. Check out Purex on Facebook and Twitter.